Aerial view of Fremantle with Perth city center in the background. Satellite view is showing Perth, most populous city and capital of the Australian state of Western Australia (WA). The fourth largest city in Australia is located in south western Australia on the banks of the Swan River, at Australia's western seaboard of the Indian Ocean. 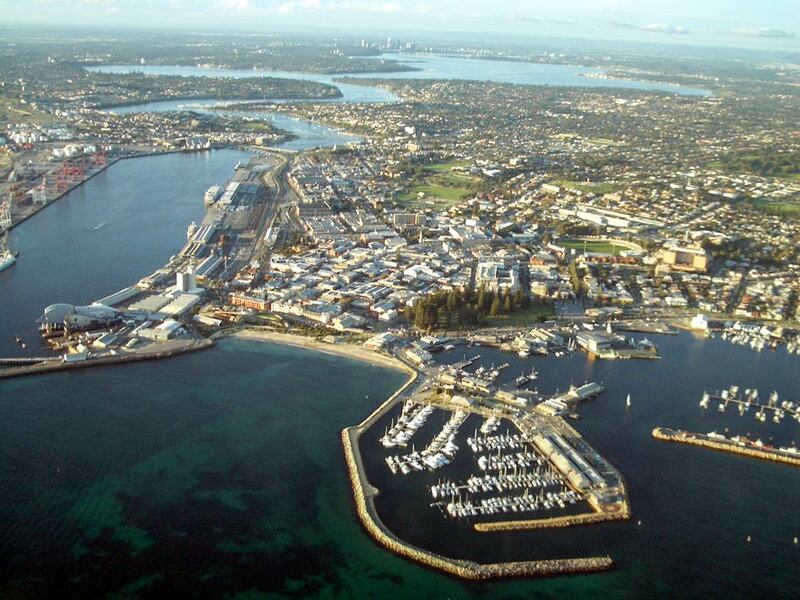 The city has a population of about 1.6 million residents in the metropolitan area (including the port of Fremantle). The former administrative center of the British Swan River Colony of Western Australia was founded by the British in 1829, it developed rapidly after the discovery of gold in the region in 1890 and the opening of the harbor at Fremantle in 1897. Western Australia's administrative, commercial, and cultural center offers in its Central Business District many shops, bars, restaurants, galleries like the Perth Institute of Contemporary Arts (PICA), theatres like the State Theatre Centre of Western Australia, and museums, like the Western Australian Museum or the Western Australian Maritime Museum in Fremantle. Perth is listed in the Top 10 of the World's Most Liveable Cities (rank 8), published in The Economist's "Liveability rankings" index in 2010. Perth is the seat of the Parliament of Western Australia as well as of the Governor of Western Australia. The only university in the state the University of Western Australia is also located in the city. The Map shows a city map of Perth with expressways, main roads and streets; and the location of Perth Airport (IATA Code: PER) located in Redcliffe about 12 km (7.5 mi) north east of the city center. Zoom out to find Pearce Air Base, currently the center of the search operation for Malaysian Airlines Flight MH 370. Google Earth: Map and Satellite View of the city of Perth, Western Australia, Australia. Official site of the City of Perth. Tourism information for Perth region. The official site of The South Australian Tourism Commission.